Install the various commit graph add-ons to see how each copes with the dataset. 1. Bit-Booster, 5. Bitbucket Cloud and 0. "git log --graph" all render the graph correctly. Of these, only "Bit-Booster With Commit Graph" is available to use on Atlassian Bitbucket Server, supporting our claim that we have the best commit graph on that platform. 2. Awesome Graphs connects orphan branches to a single line that connects to nothing. Octopus merges do not render at all. 3. Commit Graph (cha55son) is completely broken with this dataset. 4. 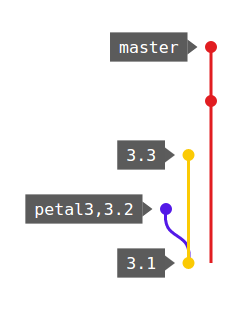 Git Flow Chart does not seem to understand how to follow 'master', but otherwise draws an isomorphically correct graph.